Multi-rotor or multicopter refers to the aerial vehicle mechanism. Multi-rotor drone is a type of rotorcraft consisting of more than two rotors/propellers. Apart from this, multi-rotor is a highly unstable rotorcraft and it requires aka flight controller device for stable flight. The flight motion of multi-rotor is controlled by speeding or slowing multiple downward thrust propellers. There are different types of multi-rotors are present in market such as tricopters, quadcopters, hexacopters and octocopters. Multi-rotor drones have a wide range of application such as aerial photography/videography, mapping & surveying, agriculture, crop spraying, asset inspection and payload. Global multi-rotor drones market is anticipated to witness a robust growth over the forecast period 2017-2024. Global multi-rotor drone market stood at valuation around USD 12.6 Billion in 2016. Multi-rotor drone market is expected to behold this positive growth in near future owing to their increased application in end-use industries. Asia Pacific multi-rotor drones market is expected to grow at highest CAGR during the forecast period. High investment in research and development sector in emerging economies such as China and India has given boost to the market of multi-cotor drones in Asia Pacific region. Further, Middle East & Africa and Latin America regions are also expected to witness a satisfactory growth in near future due to high investment in R&D sector in these regions. Multicopter provides revolutionary abilities to do difficult things or to go somewhere, where a person has never been before. Over the past few years, it has been observed that the unprecedented abilities of multi-rotor drones have attracted consumers towards it across the globe. 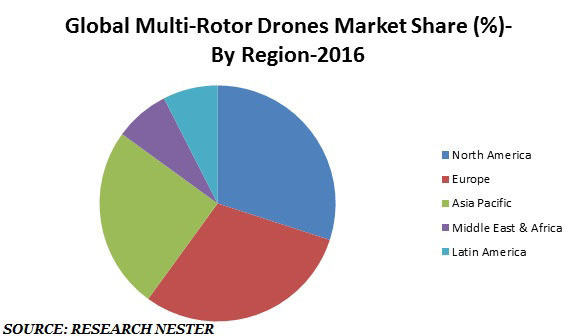 Increasing demand for multi-rotors in non-military sector such as agriculture, environment inspection, sports coverage, entertainment & media industries, parcel delivery and others is a major growth driver of global multi-rotor drones market. Additionally, high adoption rate of non-military multi-rotor drones is expected to foster the growth of global multi-rotor drones market in near future. Low maintenance and affordable cost of drones are some of the key factors which are expected to propel the demand for multi-rotor drones in near future. Increasing use of multi-rotors drones in law enhancement and other military activities is one of the major factors driving the growth of multi-rotors drone market. Moreover, increasing terrorism activities in countries such as India, Spain, Israel and others have made the government of these countries more concerned about the enhancement of defense and security sector. The adoption of multi-rotor in defense & security sector is expected to increase the demand for multi-rotor drones over the forecast period. However, budget cuts of defense sector are a major factor dampening the growth of the global multi rotor drone market. Factors such as limited flight sufferance of multi-rotor drones and their payload capacity are some of major challenges which are restraining the growth of market. Apart from this, high price of multi-rotors is a major factor which is slowing down the growth of global multi-rotor drones market.